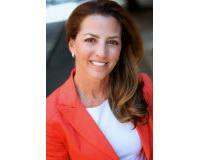 Distinctive New Construction by renowned Maguire Builders! This stunning contemporary host 3 Bedrooms, 2 1/2 Baths, 2500+ square feet, maple flooring, high ceilings, Anderson windows, metal railings, 8' glass doors, finished basement, roof deck, rear yard and more! Enter this spacious & bright open floor plan into a gorgeous black & white Gourmet Kitchen with 42" cabinets, a luxurious honed granite counter top, subway tile backsplash, LED under cabinet lighting, stainless steel appliances and sink plus a breakfast island; Open Dining/Living Room with great natural light, 9' ceilings and extra tall glass doors that lead to the garden. 2nd floor features an incredibly bright open Den, the Master Bedroom/Bath features a custom vanity with double sinks, a corian counter top, frameless glass shower doors and lots of closets; 3rd floor consists of 2 large bedrooms, a full tile hall bath and laundry; Walk up to a fiberglass roof deck with glass railings and a fantastic panoramic city view. Finished Basement has high ceilings, tile floors, powder room, closet, plus an extra large room for storage/mechanicals. Other features include 2 zone HVAC, intercom, alarm system plus approved 10 Year Tax Abatement! This sensational 28' wide townhouse located on a quintessential Fitler Square block features 4 bedrooms, 2 ½ baths, 3 decks, a garden plus a full 2 CAR GARAGE! This stunning sun drenched 2nd floor is an incredible space for entertaining! The open floor plan has 10' ceilings, hardwood floors, a living room with a gas fireplace with marble surround, a huge Kitchen with ample cabinets and granite counter tops, a breakfast island easily seats 4, stainless steel appliances including a wine cooler, a dining area with doors leading to a deck with a gas hookup for grilling. The spacious Master bedroom suite with a sunny alcove sitting area consists of two large walk in closets, a sumptuous master bath with two separate vanities opposite each other with quartz tops, shower has glass tile walls/pebble stone floor and a frameless shower door, a cool frosted glass enclosed toilet, enjoy soaking in the Jacuzzi tub with glass tile surround. The top floor has 2 bedrooms, a southern exposed deck, a hall tile bath, an open seating area with access to another deck. Other amenities include 2 zone HVAC, 2 water heaters, 3 ceiling fans, solid wood doors and security system. 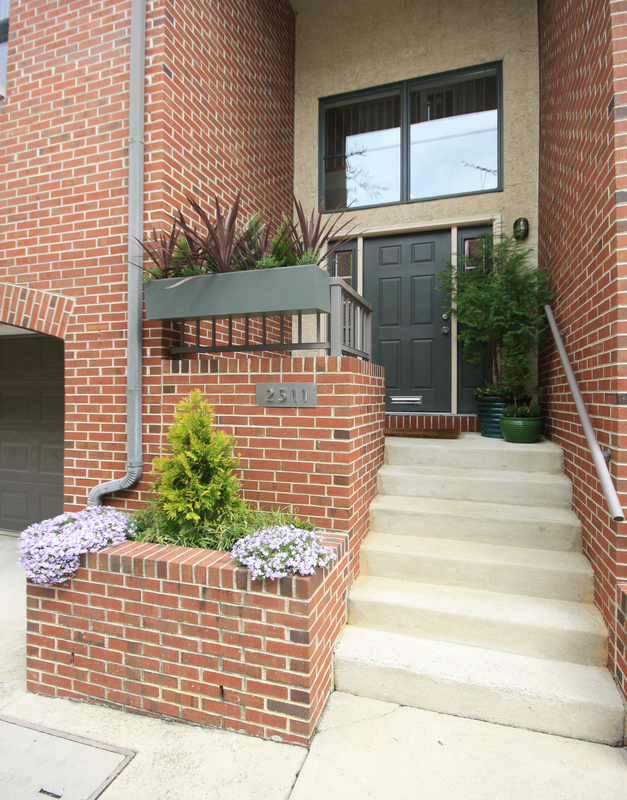 Walking distance to the Schuylkill River Park. You can run, walk, cycle all the way to Valley Forge, enjoy the dog park, tennis, the playground & more. Walkable to markets and renown local restaurants, Rittenhouse Square, HUP, CHOP, Penn Station, 30th Street Station, & easy access to the highways. PLUS, Located in the Albert M. Greenfield catchment! Magnificent New Construction by renowned Maguire Builders! This stunning contemporary showcases style and comfort with 3 Bedrooms, 4 Baths, Den, Media Room, maple floors (finished on site), 9' ceilings, Pella windows, dual HVAC systems, hybrid insulation, custom built in wardrobe cabinetry by Lutzwood, luxurious baths, frameless glass shower enclosures, Kohler and Grohe Fixtures, Quartz counter tops throughout, 8' glass bedroom doors, a state of the art intercom system with exterior camera, full finished basement, tons of natural light plus an amazing roof deck with panoramic city views. The gourmet Kitchen features stainless steel appliances which include Sub Zero Refrigerator, Wolf 6 burner stove, Best hood, Asko dishwasher & Wolf microwave, an extra wide/deep stainless steel sink, an 8' island, custom cabinets by Lutzwood, and glass subway tile backsplash. The open living room and dining room share a view of the beautiful 2-tiered garden via the full glass windows/doors. The Second Floor boasts a spacious open den which overlooks the living room with a tree top view, a full-size laundry closet and the Master Bedroom Suite with a finely appointed sumptuous Master Bath. The Third Floor features an En Suite bedroom, an additional bedroom plus a gorgeous hall bath. 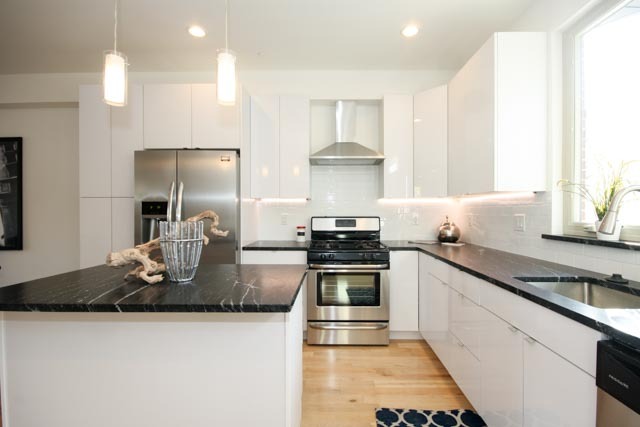 This contemporary gem is located on a charming block and is walking distance to Fitler and Rittenhouse Square, some of the finest restaurants, coffee shops, shopping and Center City's business district. 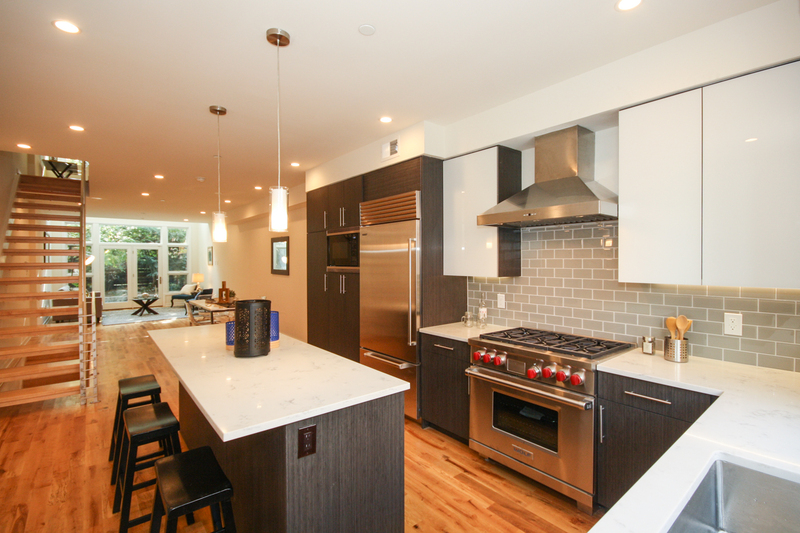 Move right in to this recently renovated modern gem with tons of natural light. The open floor plan features a living room/dining area, maple floors throughout, recessed lighting, built in shelves, accent walls, a full basement with a full-size washer/dryer and plenty of storage plus a fenced in rear patio. This gorgeous bright kitchen has a modern coffered accent ceiling, shaker style maple cabinets, granite countertops, tile backsplash, stainless steel GE appliance package, a stainless steel sink and range hood. The second floor has three nice size bedrooms. The bathroom is wrapped in Italian ceramic tile. The walls are tiled from floor to ceiling, tub surround and floors. 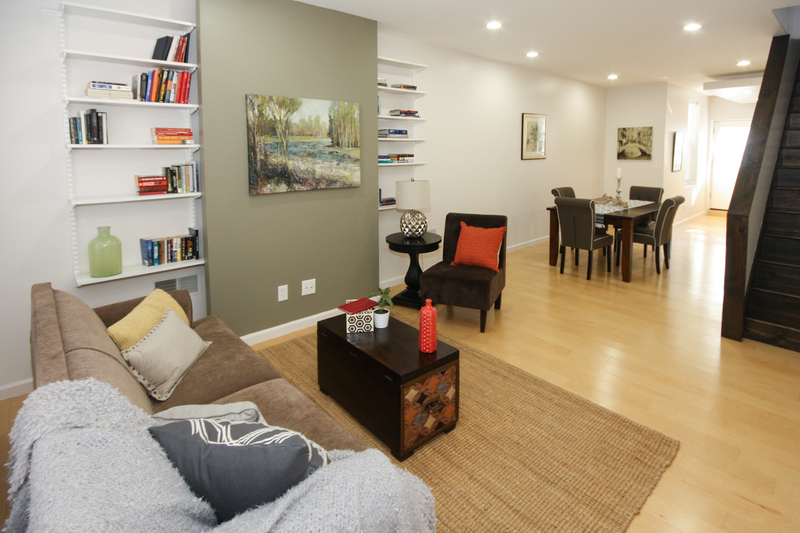 Enjoy easy living in the heart of the vibrant Point Breeze neighborhood.